This stars bordered with eagle and police badge is perfect for the courageous graduates of the police academy. 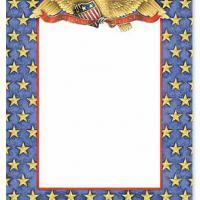 Use these blank card printable graduation invitations for announcements and invitations to bring people over to celebrate with you. Type the details of the party and print these on a good card stock. These free printable invitations are just the thing to celebrate your new induction into the world of the police officers, so print today and have a great graduation party.